SARMS | rakusol asia pte. ltd.
Open-source software under the term of the GNU General Public License Version3. With this output of discrepancy information, department managers keep track of the latest discrepancies and apply those discrepancies on the SARMS asset register. In order to maintain compliance and IT security, knowing what IT assets you already have such as…..
and creating policies and procedures are essential. With implementation of SARMS, your organization can gain control of IT assets more properly. What type of organization is recommended? How should we begin IT security and prevent illegal copying with SAM? Without implementing a SAM, it is difficult for organization with more than one hundred units of hardware to maintain control over their IT assets. Please consider our SARMS solution before getting started. We understand the necessity of SAM, but we are concerned about the cost. SARMS is licensed under the AGPL, and provided free of charge. SARMS can save costs in the case of outsourcing the implementation process. Could implementing SAM be a daunting task? By using “approval request” feature of SARMS, it can balance the work load of each employee when updating asset registers. Distributed management feature of SARMS enables departmental management regarding each IT asset. How can we achieve a SAM maturity level 3? SARMS is recognized as certified in the standard of SAM maturity level 3 based on SAMAC. Is there a SAM system with actual sales results? As a prerequisite, a software inventory tool needs to be installed on hardware to be managed. 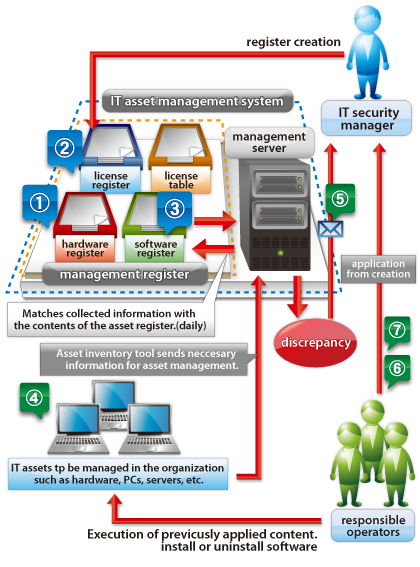 IT asset management system consists of an inventory tool and SARMS application. Add all the managed hardware to the hardware asset register on IT asset management system. In the license register, add all of the software and their number of license owned by each department. In the software asset register, add software installed on each computer of the department. You can’t exceed the number of license you have previously added on the license register. Inventory information of the software on each computer is collected daily via the network. Check the discrepancies found when matching collected information by the inventory tool with recorded information on the software register. Under the direction of the IT security manager, responsible operators updates IT asset information on the asset registers. Essential points of ISO19770-1 based software asset management. ✓POINT ① : There is the basic asset register. There have to be the basic asset registers which cover necessary items, and their changes have to be recorded. ✓POINT ② : The workflow feature is being implemented. As the Change management process required by ISO19770-1, changes made in the basic asset registers have to go through the application approval process, and be reviewed by third parties, and be properly approved. This feature provided on the system is called the workflow feature. The only one software with a built-in top quality license dictionary! Regularly updates through maintenance services! Our license dictionary in SARMS is not typical software dictionary which many other vendors are using, but a license dictionary which allows multiple software to be managed by each license. The license dictionary in SARMS already has tens of thousands of license information with which customers can match installed software with its license at a rate of 80 to 99%. This can also contribute to reducing the workload of IT department.